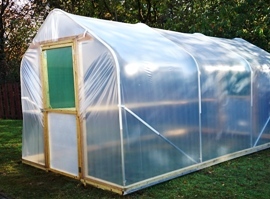 Our "Poly-Pitch" pitched roof polytunnel adds a touch of elegance to the world of polytunnels. The traditional circular shape of a polytunnel isn't to everybody's taste and so the pitched roof polytunnel combines the look of a glasshouse with the advantages of a polytunnel. Previously, a polytunnel may have been frowned upon as a permanent feature of the garden whereas the "Poly-Pitch" could be just as in keeping as a glasshouse, and at a fraction of the cost! Polythene has now been developed to filter the sunlight entering the polytunnel to give more favourable growing conditions to produce healthier and more prolific crops. Plus the polythene cladding provides a much safer option than glass particularly for small children or those with restricted mobility. We've made sure that space isn't compromised with vertical sides of 1.5m before the start of the curve so an average height person can stand close to the sides without restriction. 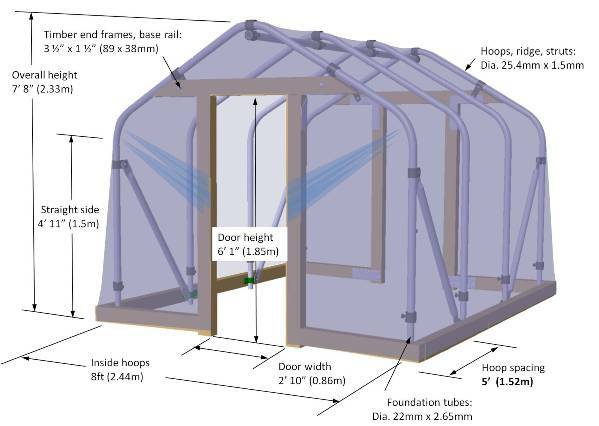 We've included the timber base rail as standard with the pitched roof polytunnel, an option that not only improves the look of the polytunnel but also makes the kit easier to build. As with all our polytunnels, we consider the fine details to make sure each component is designed to fulfil its purpose and manufactured by us to ensure consistent quality. Our "Poly-Pitch" polytunnels are supplied with the latest technology polythene cover: Thermal Heat Barrier (THB) for improved temperature control. Reduces heat build-up on hot days, retains heat at night time. Anti-fog / Anti-condensate (AF) for moisture control. Avoids fog forming on those cold mornings and stops condensation forming as droplets, which can reflect up to 40% of sunlight and can cause spread of fungal diseases. End Frames, Base Rails: Tanalith treated timber, 1½" x 3½" (actual size), planed with rounded corners for easier handling and smooth appearance.